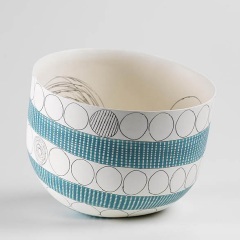 For us, a crucial facet of UK contemporary ceramics we choose to showcase on this site is that, not only does it have to break new boundaries and mobilise fresh ideas, but also that it must look good (to us). It's easy just to be weird in order to be different. Likewise it's easy to be shocking or discordant to come over as original, but the clever people also understand how to present visual treats rather than torture. 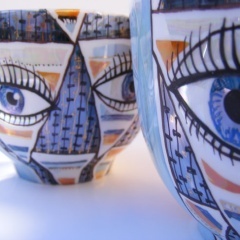 Seeing and being able to enjoy the upsurge of creativity within the medium of ceramics today is an uplifting experience. Post-modern 21st century culture has allowed artists to reinvent everything. There are no rules or constraints. The great thing about this modern ceramics section for us is the diversity we can showcase. There are artists who either buy or cast whiteware and decorate it sumptuously like Elizabeth Emmens-Wilson. So we don't have to an earnest thrower to qualify to be here. 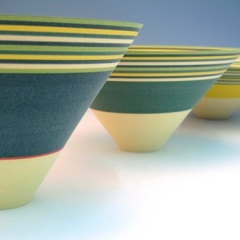 Whereas someone like Andrew Frew is a bone fide contemporary ceramic studio potter he is also very much as much part of this scene as Lara Scobie, a studio artist who slip casts her pots. Sara Moorhouse, as a PhD, combines her academic approach, especially with regard to colour theory, with a nuances of exactly how she sees the world within the bigger framework. 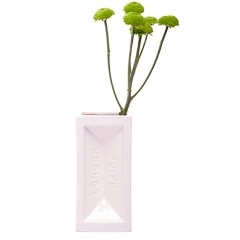 Casting a London brick and making a porcelain vase out of it wouldn't qualify you to gain entry to the Potter's Guild, but it qualifies the brilliant modern artists/designers at Stolen Art to get a showcase here with us enthusiasts. 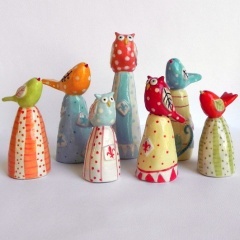 Elizabeth Joy creates her ceramics in the shape of achingly lush and colourful owl collectables. Is this art? We think so! She does what she wants to do (is driven to do) and if other people like it too, she is overjoyed (especially if they want to buy it). Siukwan Wong is a Hong Kong artist working out of the UK. 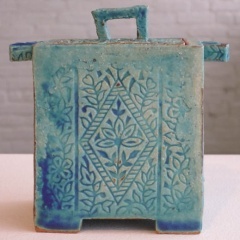 We saw her deeply intriguing and lovely Treasure Box pot (above) in which she is making a fusion of her Eastern and Western cultures (she went to Camberwell College). 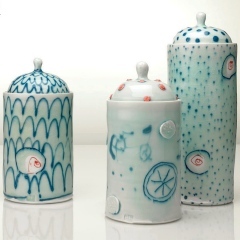 She draws inspiration from ancient Chinese art and wants to work with unpretentious natural processes. 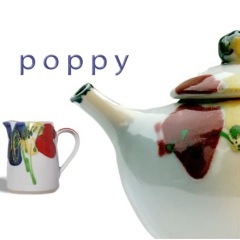 Dartington Pottery have to be in this section, simply because their unique combination of tradition with contemporary shape and colour story (like in their Poppy collection designed by Janice Tchalenko), has no match.